Christopher Robert Coste (born February 4, 1973) is an author and former Major League Baseball catcher. Coste was on a Major League Baseball team for the first time in his career at age 33 after twelve seasons of independent and minor league baseball. He is currently an analyst on Post Game Live for the Philadelphia Phillies. After attending Fargo South High School, Coste went to Kishwaukee College for 1 year, a Division II college, but later left. He then attended classes and played baseball for Concordia College, a Division III school in Minnesota, where he was a three-time All-American. He started his professional career in 1995 playing for Brainerd, Minnesota in the independent North Central League. When the league folded in July he joined the Brandon Grey Owls in the independent Prairie League. From 1996 to 1999, he played four seasons for the Fargo-Moorhead RedHawks of the independent Northern League. In 2000, Coste signed with the Cleveland Indians organization, having gotten significant playing with then Triple-A affiliate Buffalo Bisons. He spent 2003 with the Boston Red Sox organization and 2004 in the Milwaukee Brewers system. Coste first signed with the Phillies in 2005, spending the entire season with their Triple-A affiliate, then known as the Scranton/Wilkes-Barre Red Barons. He remained with Scranton/Wilkes-Barre until his promotion to the Phillies, facilitated by his fantastic performance in 2006 spring training. After starting the 2007 season in Triple-A, Coste was called back up to the majors on May 12, 2007. On May 25, 2007, Ryan Howard was re-activated off the DL and the Phillies sent Coste back to the minors to Double-A Reading. Coste chose to go to Reading so that he could start and play every day, and because it would help the club if he was ready, rather than being Jason Jaramillo's backup at Triple-A Ottawa. In late June 2007, Coste was called back up from Reading as a result of Jon Lieber's season-ending injury and Jayson Werth's wrist injury. Coste finished the 2007 season with a .278 batting average, 5 home runs, and 22 RBI in 48 games. 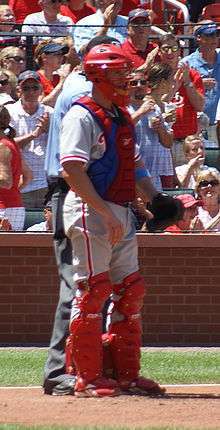 For the 2008 season, Coste was slated as the Phillies' backup catcher behind Carlos Ruiz. In a game against the Mets on August 26, 2008, Coste went 4 for 4 without even starting the game. He entered as a pinch hitter in the eighth inning, and became the first player in 63 years to appear at least that late into a game but still record 4 hits. He delivered a game-winning walk-off single in the 13th inning. Coste was very popular with Phillies fans and had a fan club that was at every Phillies game known as the Coste Guard. They wore red bathing suits and white T-shirts. They also wore sunglasses, and sunscreen on their noses; fans could hear their whistles which they used to help cheer on the Phillies and Coste. On October 29, 2008, Coste became the first player that originated from Division III college baseball's MIAC to win a World Series. Coste was claimed off waivers on July 10, 2009 by the Astros. 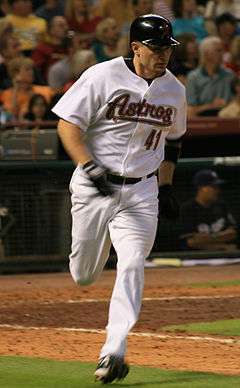 Due to starting first baseman Lance Berkman's injured calf, Coste found playing time at first base for the Astros. On November 30, 2009, Coste signed with the New York Mets. On March 29, 2010, Coste was claimed off waivers by the Washington Nationals. Before the season began he injured his elbow which required Tommy John surgery in May 2010. He was released on June 5, 2010. Coste retired from professional baseball after that. Coste wrote his first book about his experiences in professional baseball: "Hey... I'm Just the Catcher: An Inside Look at a Northern League Season From Behind the Plate," published in 1997. This book covers his first few seasons in independent baseball leagues, mainly the RedHawks (in his hometown). This book is out of print and supplanted by his new book. 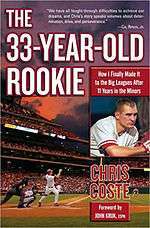 2008 saw the release of Coste's second autobiography, "The 33-Year-Old Rookie: How I Finally Made it to the Big Leagues After Eleven Years in the Minors." The book, which chronicles Coste's first season in the majors, contains a foreword by John Kruk. This book covers Coste's professional career up through his third season (2008) with the Phillies. It includes nearly all the historical material found in his first book (independent baseball) as well as the time in the affiliated minor leagues. Due to the recent success of films about athletes such as Vince Papale and Jim Morris, movie studio representatives have contacted Coste about the possibility of a movie about his struggle from career minor-leaguer to the majors. Coste is now an in-studio analyst on Comcast SportsNet. He appears on Phillies Pregame Live and Postgame Live shows. He also appears on Daily News Live. Besides this appearances, Coste is currently the head baseball coach at Concordia College. 1 2 "Philadelphia Phillies Transactions May 2007". MLB.com. Retrieved 2009-02-17. ↑ Grodsky, John (2009-07-24). "Berkman shaken but unbowed by injury". MLB.com. Retrieved 2009-07-25. ↑ Noble, Marty (2009-11-30). "Mets re-sign Cora, ink catcher Coste". MLB.com. Retrieved 2009-12-01. ↑ "Staff Directory - Baseball Coaching Staff". Concordia College. 2012. Retrieved 14 September 2013. Publisher's page for "The 33-Year-Old Rookie"